Listening to the new release, it's easy to hear what was so revolutionary about "La Pasión.'' Most music that comes under the "crossover'' label tries to incorporate one genre into another; almost inevitably the result is stilted and artificial. Golijov, by contrast, writes mambos and rumbas as convincingly as he composes lyrical, minimalist-inflected classical music. In "La Pasión,'' he yoked them together without sacrificing stylistic authenticity. Some of his choices are startling: Listen to the "Por que?'' (Why?'') movement and you will think you've stumbled into a noisy Brazilian street fair instead of a retelling of Jesus' anointing at Bethany. Here is that rare piece of music that legitimately inhabits a multitude of genres; genre, in a way, ceases to matter. "La Pasión'' didn't just launch Golijov's career when it premiered, it made him into a phenomenon. A tumultuous half-hour ovation followed its first performance, and a similar reception greeted the US debut, at Symphony Hall in 2001. In his early 40s Golijov became perhaps the most famous composer of his generation. Suddenly, critics were welcoming his ascent as the herald of a new age of unbounded musical cross-pollination. 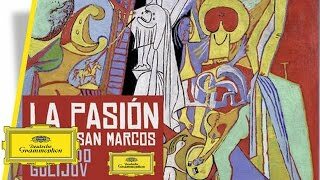 It's easy to understand why Osvaldo Golijov's "La Pasión Según San Marcos" received a 30-minute ovation at its 2000 Stuttgart premiere: a transferral of the Easter story to Latin America, it's a vibrant, sonically colourful experience in which the native South American strains of samba, tango and salsa contribute as much as the orchestral and choral elements. The aria performances owe more to Portuguese fado than to European classical singing. Golijov's intention was "to present a dark Jesus, not a pale European Jesus", and his success is partly due to his incorporation of native styles and structures. The result is an engaging tapestry in which demotic forms and religious chorale combine with piquant, astringent energy. His take on the suffering of the human condition is often beautiful, blending many magical sounds. This is cultural diversity at its most inspired, woven around the greatest story ever told. The recording is excellent . . . no one will be disappointed in this very close, clean and clear recording . . . it is a landmark work that will be even more important if this composer fulfills the expectations that so many have heaped upon him. This beautiful recording should help . . . Hearing it is impressive enough, but the live DVD version adds to the experience.
. . . a great performance . . . [a] warm, soulful approach . . . Both conductors bring their best to the performance of "La Pasión", embracing the virtuosic breadth of this music. Among the excellent cast of performers, pride of place is shared by alto Biella Da Costa and soprano Jessica Rivera . . . For this reviewer, Jessica Rivera's performance of Peter's lament is the most powerful moment in the entire work. Her rendition is characterized by a delicate vulnerability and a profound sense of loss . . . Their ten-year association with this music has given them a wise, nuanced performance quality. It is hard to imagine any other chorus surpassing their performance. This release is highly recommended. Not only will it appeal to fans of contemporary classical music, it will also be a welcome addition to the collections of aficionados of Latin culture and to all who care deeply about the spiritual in music.
. . . Afro-Caribbean rhythms, Brazilian martial arts and a Jewish prayer of mourning -- and this somewhat risky cross-cultural bet by Argentine composer Osvaldo Golijov has paid off multifold . . . It's easily one of my favorite works of the 21st century so far, and if you haven't heard it yet, you're in for an incredible experience.
. . . [Golijov] nous offre une partition épicée, populaire, flamboyante et tragique où s'imposent surtout les voix et les percussions, le rituel collectif et la transe latinoafricaine . . . Captivant.